Many of us enjoy a vase of flowers in the home. You may have treated yourself to a bouquet whilst shopping or have received them as a surprise gift. Wherever they are from you expect to enjoy a beautiful display of flowers for many days. How you care for your flowers can have an impact on just how long they may last. My recent homework task, for the FlowerStart online flower arranging workshop I am enrolled on has me conducting my own flower experiment. What to add to the water of your flowers? Most purchased flowers will come with a special sachet of food for you to add to the water. But you may also have heard many an old wives tale about adding lemonade, or a coin to your water to prolong the life of your flowers. My experiment? 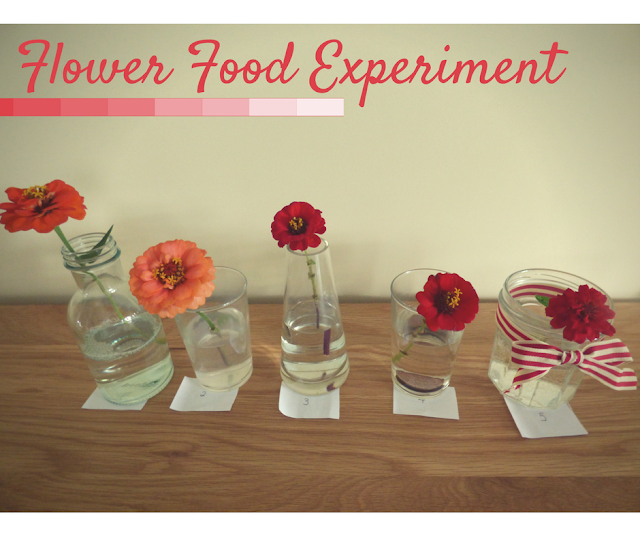 How long will flowers last in water with different types of flower food. I took 5 single Zinnia flowers, cut fresh from my garden. I used 5 very clean glass vases / glasses, which contained tap water. I then added different ingredients to each and then added the flower. Six days later I checked on each of the flowers. 1. Home made flower food - the flower with the homemade flower food is dead and you would normally have removed the flower from any display. 2. Lemon juice - the flower is in good condition but the water has gone cloudy has a gloopy mould around the stem of the flower. 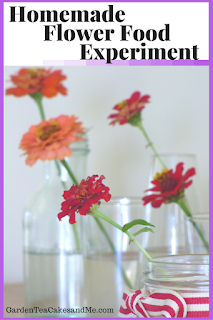 I have left the flower in the water but if I was not doing this experiment I would change the water but still add lemon juice. 3. Beach - the flower is in very good condition and the water is very clear. 4. Sugar and coin - the flower petals are starting to die, and the water has turned cloudy. 5. Just water - the flower is in good condition but just starting to turn at the edge of the petals. There is still a few more days to go and I will watch the remaining flowers with interest. At the moment there is not much to choose between flower 3 and 5, that's bleach + water and plain tap water. After 12 days, it was a close call between the bleach and just the plain water. I think the bleach may just have won this one. I do plan to try this again using sachet flower food and not my homemade version, just to be sure. It has been an interesting and fascinating course, who would of thought it was possible to complete a flower arranging course online. You can see how my flower arranging has progressed with my previous blog post about my Flower Arrangement in a Teacup, which by the way is super sweet and far more beautiful than I had ever hoped. Yes that is me giving myself a pat on the back! Thank you to those of you who have found me via the fabulous Five on Friday link up with Amy at Love Made My Home, see my sidebar for the badge and to join in. Do let me know if you have a tip you use for prolonging the life of your vase of flowers. Julie is a trained florist, and also teaches flower arranging workshops in Kent. The use of technology now allows Julie to teach anyone with access to a computer how to arrange flowers. The FlowerStart courses were created especially for those of us whose home or work commitments prevent you from signing up for traditional evening classes. If you want to enrol and learn how to flower arrange the next 4 week FlowerStart Classes start 30 September and costs £99. Do not worry too much about not having all the kit to take part. Julie also suggests alternative items eg. jam jars that you are sure to have at home. Disclosure: I received a subscription for the FlowerStart course in exchange for this review. I'd heard the bleach one before so I usually add just a drop, or the packet food that comes with the flowers from the shops. What an interesting experiment, and pretty surprising results! I think changing the water regularly is probably a good idea whatever method you use, I'm going to carry on with my little drop of bleach from now on, thanks. 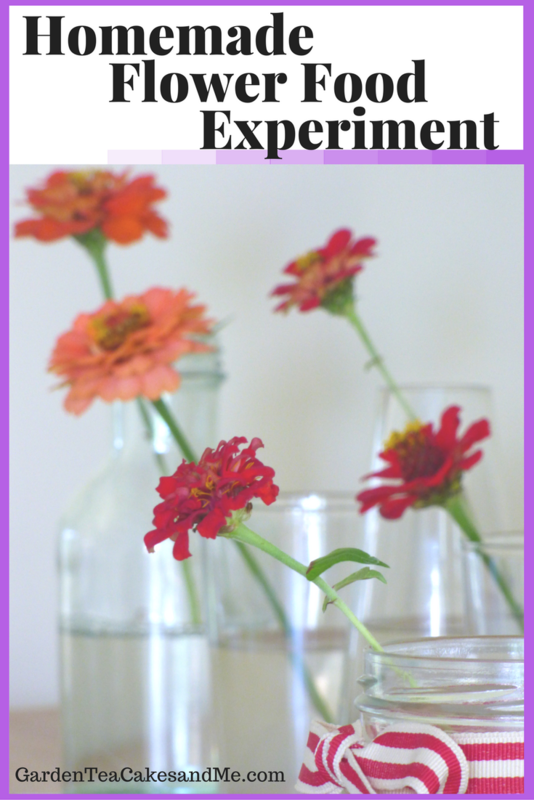 I loved reading your blog post Angela - I'm glad you've had fun with your flower food experiments. I'm looking forward to seeing what you come up with for your homework next time. What a great experiment! Reminds me of the ones the kids and I used to have to do for Science Fair when they were little. Your results are fascinating. Love the flowers in the teacup. How much bleach did you put in the water? I would never have thought about putting bleach in the water, how interesting! Sounds like a great course. I don't have any tips, but will be using the bleach one of yours. Love the red color of the flowers, very pretty even after so many days. I'm certainly glad to know that bleach is probably going to be the winner, as I always have it on hand. What would we do without bleach and white vinegar? I hope you'll continue sharing some of your class findings. Who doesn't love flowers? I usually just check in for Five on Friday, but I must go find that teacup arrangement.